The cucumber originated in India and was domesticated by the 7th century B.C., it spread from there to China and the Ancient Mediterranean regions, According to Oxford Companion to American Food and Drink. The Romans ate cucumber and spread it throughout the empire reaching as far north as what is now modern day Britain. It made its way to the new world in 1494 when the Spanish brought it to Haiti. It quickly spread to Florida and North America through Native American tribes. 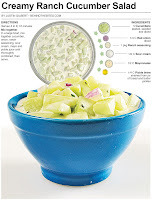 There are many varieties of cucumbers but most fall in one of two groups: pickling or slicing. In the U.S., California and the Southeast lead in growing slicing cucumbers while Michigan and North Carolina grow the most pickling variety. 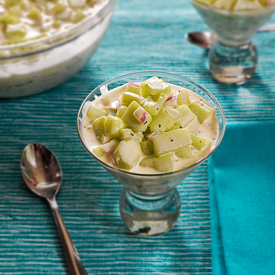 For this recipe, I use fresh slicing cucumbers in a creamy salad. It gets a flavor boost from ranch seasoning and strained bread and butter pickle brine, favorites of mine that I always have in the pantry. 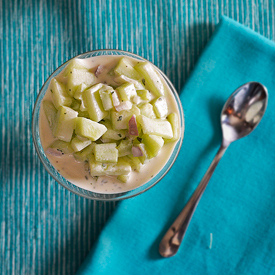 This flavorful salad is perfect for picnics and a great way to use up any extra cucumbers picked fresh from the garden. This salad was the tastiest cucumber dish I have eaten in a long time. I shared it with my Mom and Dad and both were really impressed. Once again, a packet of ranch seasoning swoops in and takes a recipe to the ultra tasty level. This is one of a number of offerings I have created this summer that feature the seasoning and all are some of the best recipes I have made this year. I think it is time to make my own version. Later today I will take leftovers of this recipe and use it on a spicy chicken tostada! I think it has the potential to be a great sauce as well, but I’ll start by using this along with some spicy chicken, jack cheese, lettuce and tomato on top of a crunchy tortilla. 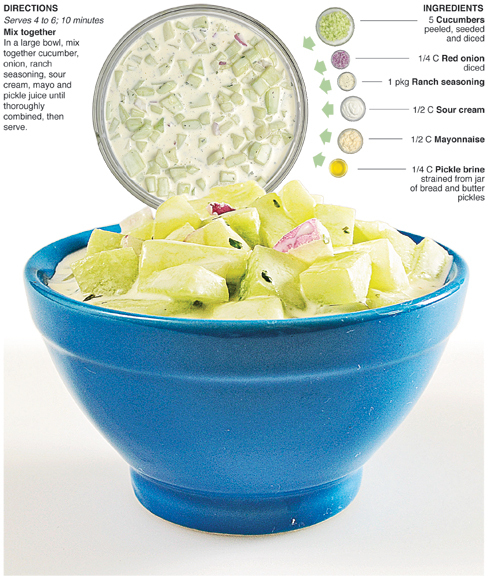 In a large bowl, mix together cucumber, onion, ranch seasoning, sour cream, mayo and pickle juice until thoroughly combined, then serve.